Human rights activist, cartoonist and international artist Kianoush Ramezani will be exhibiting his work, “The Art of Danger,” in The New Gallery for Contemporary Art at the Woodbridge Campus of Northern Virginia Community College, 2645 College Drive (WAS). The exhibition opens Tuesday, Jan. 12 and runs through Friday, Feb. 12. A closing reception is scheduled from 4 p.m. to 6 p.m. on Thursday, Feb. 11. Since 2009, Ramezani has lived in Paris as a political refugee, following the post presidential election protests in Iran. Ramezani is a co-founder of the Independent Cartoonist Rights Network International and has taught many courses and delivered lectures on the cartooning process, freedom of expression and human rights. 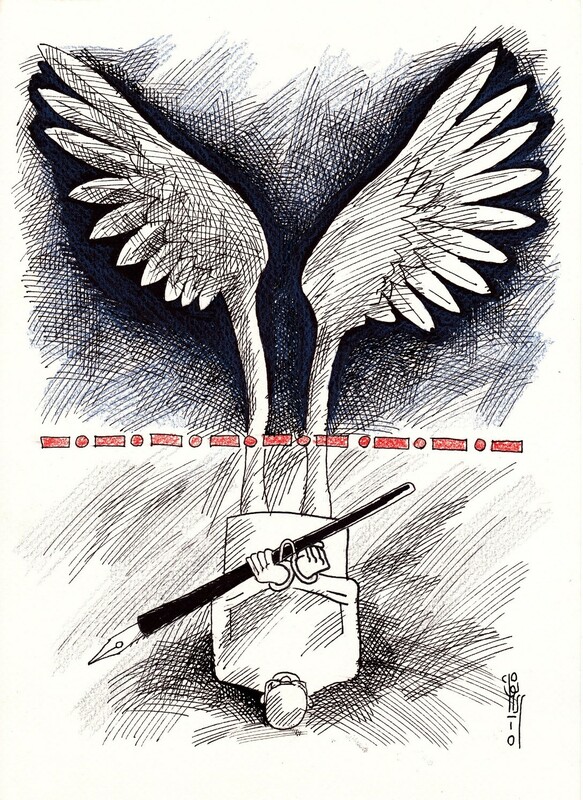 He has also co-founded and juried several cartoon expositions in Europe that support human rights in Iran as well as other exiled cartoonists and journalists. His cartoons have appeared regularly on Iranian websites such as Gozaar and Khodnevis, and in European publications, Courrier International, Siné Mensuel ARTE, Le Journaliste, Sketch Freedom International and TV5 Monde. As a former artist-in-residence at Cité Internationale des Artes in Paris, Ramezani has appeared on CNN, Euro News and MSNBC. He has given lectures at the TEDxHague Academy and the Universal Tolerance Seminar in Norway. His first book of cartoons, “The Earth’s Visual Diary,” recounts his images since he left Iran and underscores global politics from the perspective of exile. Erin Devine, NOVA-Woodbridge’s gallery director said profits from the limited edition prints, signed by Ramezani, will assist in funding the exhibition. For each print sold, one will be donated to the NOVA-Woodbridge campus. An artist lecture will be held in the Lakeside Theater in the Woodbridge Campus’ Seefeldt Building immediately following the reception on Feb.11. The exhibit, reception and lecture are free and open to the public. The New Gallery for Contemporary Art will be open from 11 a.m. to 5 p.m. Tuesday through Friday, and is located on the first floor of the Arts & Sciences Building. Parking is free in all B lots after 4 p.m. For further information contact Gallery Director, edevine@nvcc.edu or go to http://blogs.nvcc.edu/wogallery/.